SP: What do you do with all of the inspirational notes that people have anonymously let on your car? ED: The hand written notes people leave on my car is my favorite part of driving the fagbug. We all text message and communicate with technology. There's something to be said for receiving a hand written letter. I save and document all of them. I've received almost 140 so far. When I get to 1000 that will make a great book someday. SP: What do you think about the power of the word "fag?" ED: The word fag is one the strongest words in our society. It hits hard, strikes a nerve, and offends many. That being said, it's not a word that's going anywhere. It's been around for a long time and will continue to be. People know its weight and use it, for bad and good, like every other term in history that was used to oppress people. SP: What about the use of the word "fag" within the gay community? How do you feel about that? ED: It's not a word I personally use as a term of endearment or one I've ever identified with, but I understand that some people do and that's okay. It's kind of funny that I say fagbug or type fagbug many times a day but I see fagbug as it's own word. Vanity Fair just defined fagbug a few weeks ago and put it as a word to remember for the week. 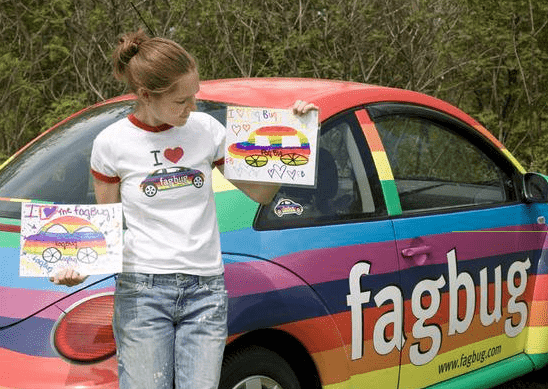 Fagbug: "An adorable, polychromatic, and frequently vandalized Volkswagen Beetle designed to facilitate LGBT-tolerance." SP: You've made two documentary films so far. Any plans for more? ED: I am currently working on a sequel for Fagbug. It will be about what it's like to drive the car since it's had the vinyl wrap on it. The sequel has more dynamic interviews because the car is more bold and brings out louder, stronger opinions. I plan to have five dealerships around the US carry rainbow Beetle's and will be documenting five driver's from various backgrounds in their experience driving them. I am currently promoting Fagbug and Living Proof and I am sure I will continue to make other films that move and evoke people in a dialogue. SP: Had you ever had any aspirations to direct documentaries before Fagbug? ED: I've been a gay activist for over a decade now. I did a lot of activism in Baltimore, Maryland working with queer youth in my early and mid twenties. That's something people don't know. People think my car was vandalized and boom, I became a gay activist. I've always been one, so whoever vandalized my car picked the wrong person to mess with. SP: What kind of activism were you involved in before your car was vandalized? ED: Before my car was vandalized, I was beginning to work on my first feature length documentary titled, Living Proof. Living Proof is a project I created in Baltimore, Maryland in 2003. It was created after having a job as youth outreach coordinator for two years in Baltimore. As part of my job, I worked closely with youth to implement 4 gay straight alliances in the inner city of Baltimore and also ran a program called Believe the HYPE, which was an HIV Youth Prevention program. This program involved 20 agencies in Baltimore, principals, advisors, and students. I worked with the teens for two years to share their testimonies to get legislation passed in Baltimore to include protection from harassment for GLBT students, we lead trainings on How To Deal With Homophobia to hundreds of new Baltimore City School Teachers, as well as Police Officers. During my activism through my job as Youth Outreach Coordinator, I spent a lot of time educating people about the negative statistics regarding GLBT youth such as suicide, depression, isolation, homelessness, HIV, etc. In getting to know the youth, I became more interested in the negative impact those statistics had and decided to leave my job to pursue creating a program called Living Proof, that was meant to counter all the negative statistics, to show you can be young and gay but also turn out successful, well adjusted, smart, funny, and confident. Living Proof was a six month improvisation theater program I directed targeted at GLBT youth from Baltimore. I worked weekly with the teens to write and perform a play based on their real life stories. The goal of the project was to bridge the gaps between the youth and their social, family and educational environments. The play Living Proof was a success, we were on NPR, premiered it at Theater Project in Baltimore to a 3 day run with standing ovation, and also were showcased at GLSEN's National Conference in Washington, DC. Living Proof was also showcased in Syracuse Cultural Workers National Peace Calendar for pride month in 2005 which comes with a teacher's guide that highlighted lessons created in the project for teachers to implement in their classes. Since 2003, I have been working religiously on the documentary, and now that it's finished plan to continue to educate on the themes and stories that are in it just as I have done with fagbug. SP: Your car's been consistently vandalized – spray-painted, keyed and egged. What does your insurance company have to say about the vandalism? ED: In four years, I've had to call my insurance four times. First, because of the initial vandalism, second because a rock hit my window in New Mexico, third because a rock was thrown in my window in Florida and fourth because another window was broken in Tennessee. I have glass coverage so when windows have been broken I've just had them fixed. When my car has been egged or keyed I've just dealt with it and cleaned it off. Most recently someone at SUNY Plattsburgh wrote "faggets + dikes need to die" on my driver's side window. When things like that happen, I document it and include it into my presentations. SP: What else do you have planned for the fagbug? ED: I'm currently working on getting the fagbug to all 50 states. I've been to 46 so far. North and South Dakota, Alaska and Hawaii are last on the list. Making to all 50 states will be a big milestone I plan to promote and celebrate. Whoever vandalized my car didn't expect I'd show anyone let alone display it to the entire country. Every decision I've made has directly been a way to communicate back to that person in the hopes to have the opposite outcome.